Mountains contain and conceal. Their vast mass towers up before us, blocking the view of what lies behind. Mountains raise the horizon far upwards, denying any prospect of a distant view of the sky. The act of seeing collides with the rock face and feels its way along the uptilted landscape. The longer I look at the mountains the more it becomes clear that the purportedly uncompromising visibility of the mountains in fact harbours invisibility and inaccessibility. Their impressive altitude arises from an unfathomable depth, their presence issues from transience, their hardness is brittle, their eternity shows cracks. Mountains are near and far at once, a quality they share with the highly volatile clouds. In a more immediate manner than the mountains the very presence of clouds already portends their absence. Clouds emerge from complex, immeasurably distant processes. Without notable exertion I can walk into a cloud of mist drifting low across the land, yet even in its closeness the cloud remains intangibly remote. Thus although different, mountains and clouds have fundamental similarities. 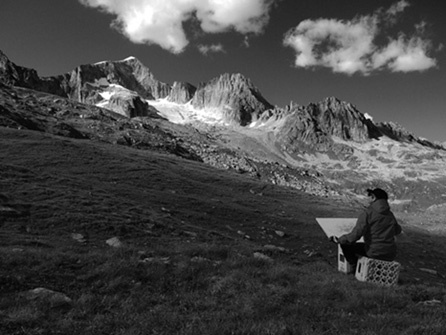 On the Furka Pass in the Swiss Alps I saw mountains and drew without looking down at the paper. 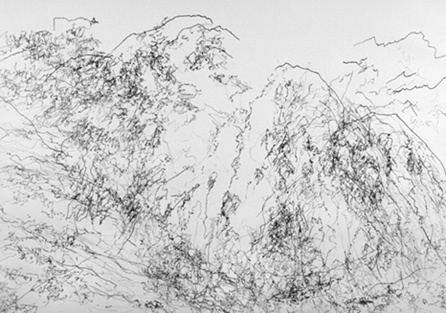 By applying this method that I call Visus Signatus (drawing the process of seeing), mountain, eyes, body, hand, pencil, paper and the ensuing drawing become one, closeness and distance unite. I worked in the same way when I looked at the clouds; while drawing I incessantly looked at the passing, constantly transforming clouds. 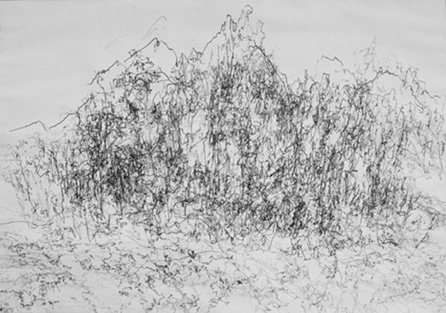 In this part of the series of Furka drawings rain became part of the work. 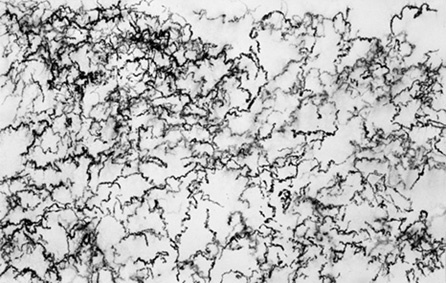 The raindrops shed upon the drawings changed everything, drawn lines flowed into one another. The Visus Signatus method is one way of exploring the process of seeing. Although I cannot see the actual process of seeing, I can see mountains and clouds. 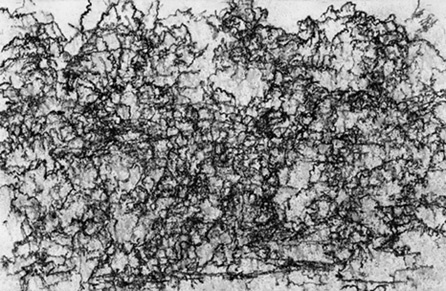 With the Visus Signatus drawings I trace the invisible process of seeing and from it, I extract something visible. On the Furka Pass this was the process of seeing the mountains and the process of seeing the clouds. Just how close the work led me to the invisible process of seeing remains open. But without the process of seeing and its invisibility I would have seen neither the mountains nor the clouds. 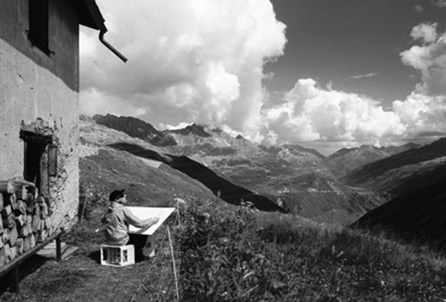 * The Furka Pass was an important site for Landscape Art in the 1980s and 1990s. 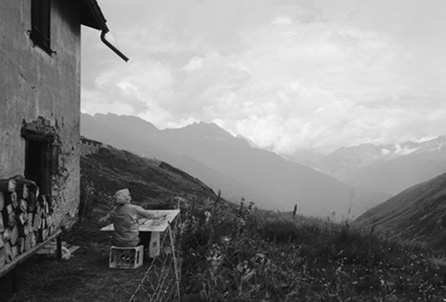 At that time Hotel Furkablick was being run by the gallerist Marc Hostettler, who invited Swiss and international artists to work in the high alpine landscape of the Furka region.